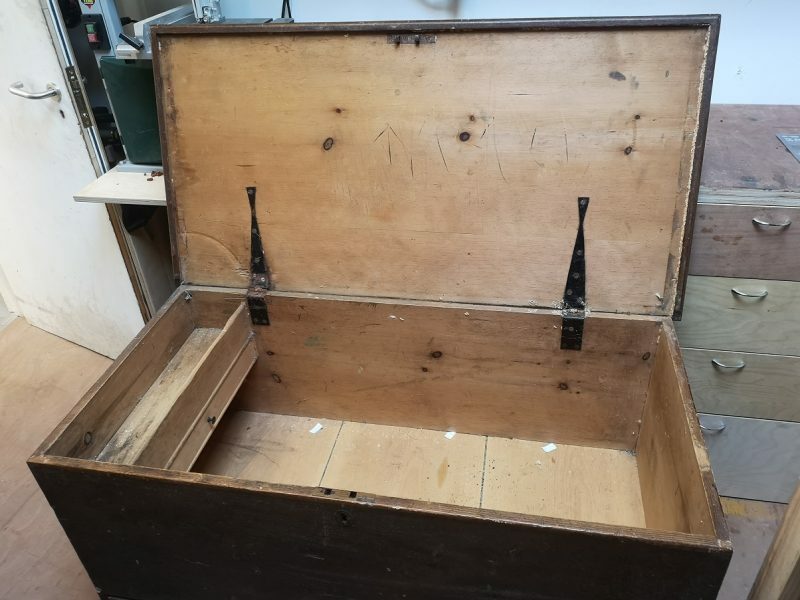 The next job on the list was a restoration, this time a Victorian blanket box. 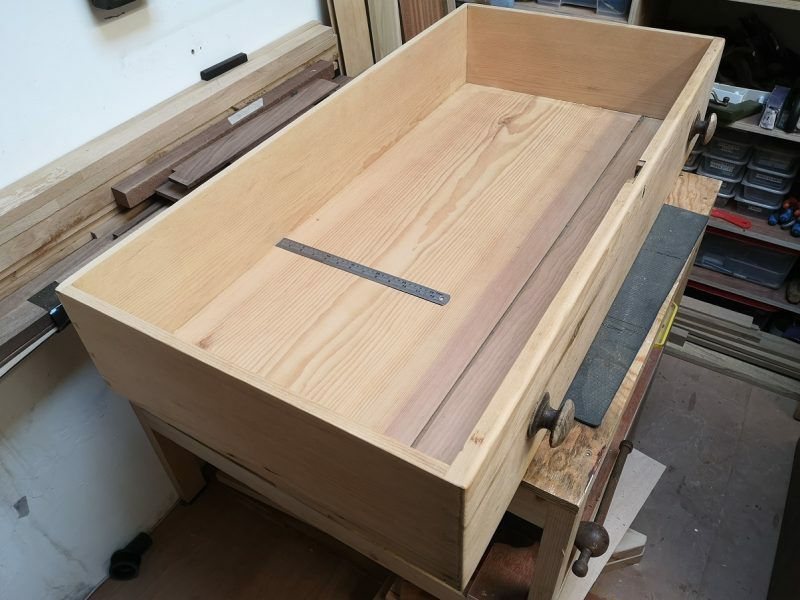 I had bought it last year to be used as my main tool chest due to the large drawer, but I had never gotten around to it. 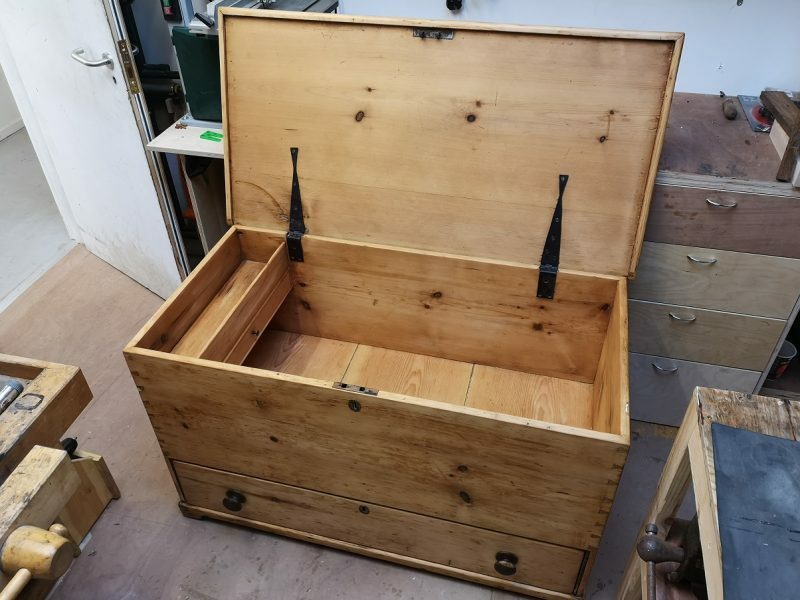 Moving to a dedicated workshop meant that it was now surplus to requirements so it was given a new use as bedroom storage. These are some kind of insect egg! They are long vacated and there was absolutely no insect activity in the chest, but just seeing them made my skin crawl! The first job was to strip all of the hardware off the chest. Once that was done it was time to start cleaning it up. 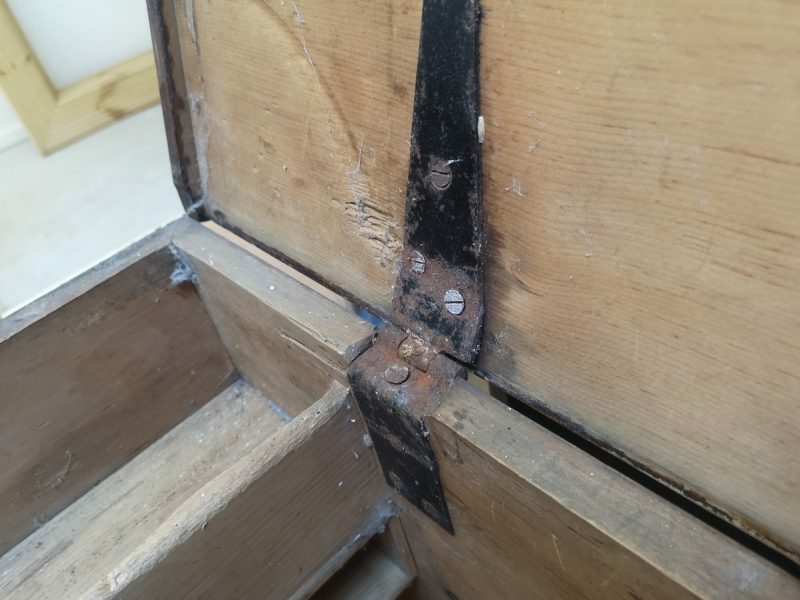 I have no idea what the finish was, or how storage had affected it, but it was a real headache to strip off. 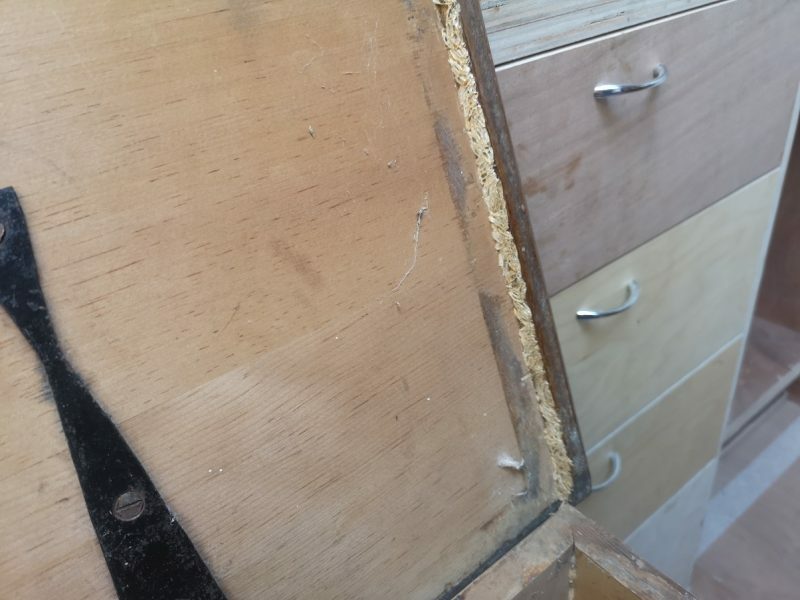 It had crystallised over time and wasn’t affected by using any of the traditional removal methods. The only option was to use a card scraper to take it off. It was also really bad for my health, because as soon as I disturbed it I got a sore throat and itchy eyes. I have a powered respirator that blows filtered air into a sealed face mask, and I wore it all the time during the restoration. The eggs themselves turned out to be a real pain to remove too. They were a weird paper / thread composition that stuck to the wood, scraper and me like glue. So far this restoration had been fighting me all the way! At this point there were a few decisions to make. 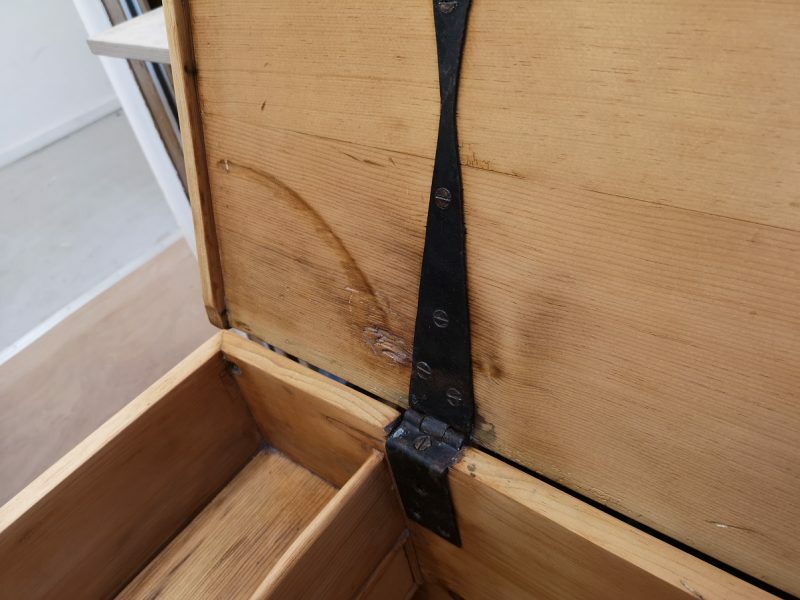 Originally a wooden arm was used to hold the lid open, but this was long gone, clearly broken off by someone closing the lid with the arm in the open position (after several attempts judging by the gouge marks the arm had left in the lid). I decided not to replace it or hide the damage other than tidy it up slightly, as it was only a matter of time before the same damage occurred and this removed the temptation. I can always fit one at a later date if necessary. Another choice to make was the drawer runners. 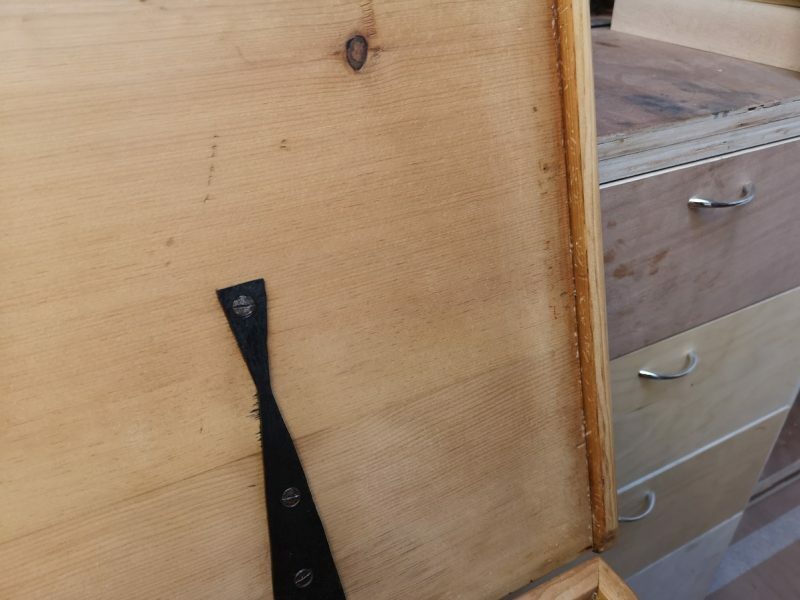 They had been worn down after many years of opening and closing the drawer, on both the chest and the drawer. After careful examination and a tiny repair I again decided to leave it alone. 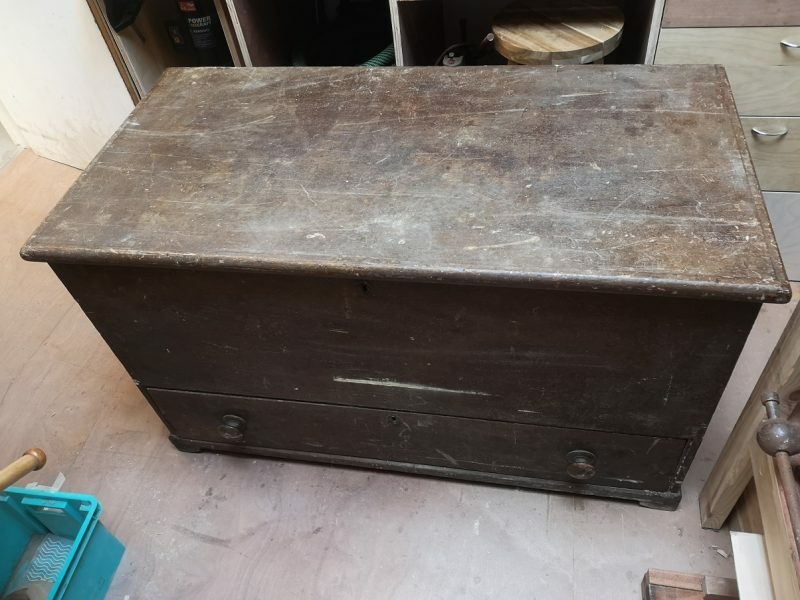 The drawer still opens smoothly and it will be an easy repair in the future if it deteriorates any further, but right now I would like to keep the piece as original as possible. The final decision was the finish. 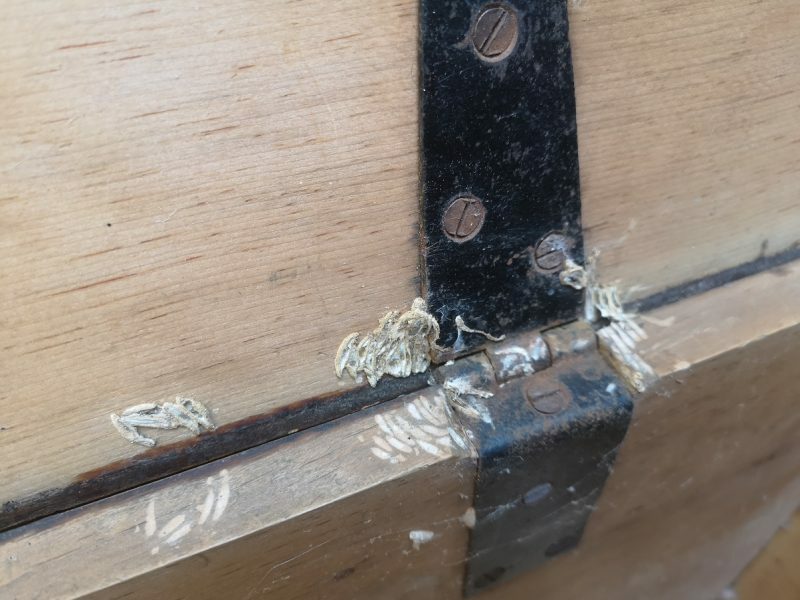 I had removed all the finish and very lightly sanded the whole unit, paying special attention to remove any splinters or sharp edges without removing the character of the piece. 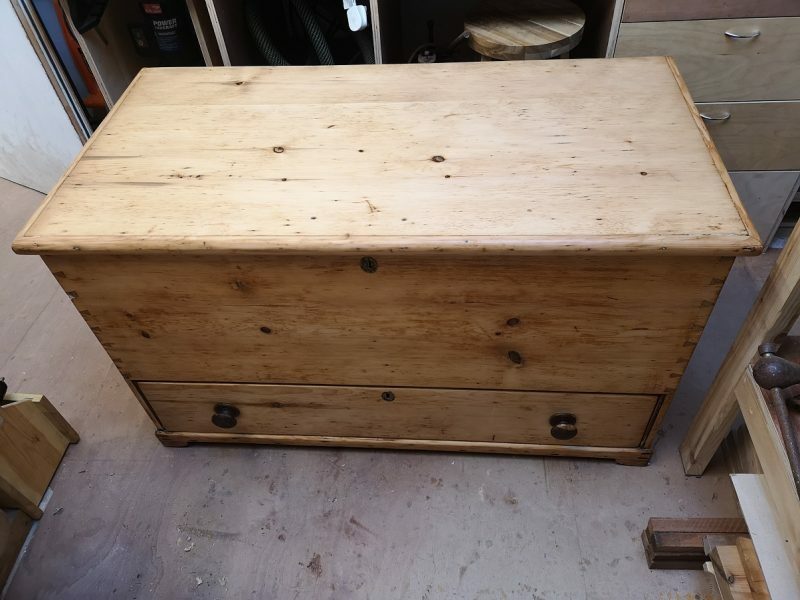 I decided on a white wax finish, as this would nourish the wood, be easy to apply and was totally clear to highlight the patina. So all in all another successful and educational restoration. It sits at the bottom of the bed where I can enjoy it every time I see it. After a few months use I stand by the decisions I made during the restoration and look forward to this antique being around for several more generations, and I promise you it won’t spend any more of that time in a barn. On to the next job!